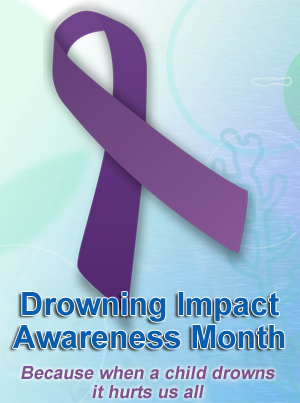 Drowning Impact Awareness Month (DIAM) began in August 2004. June, July, and August are peak times for child drownings in Arizona. Back-to-school distractions in August make it a high risk month for child drowning. Drowning is a top cause of injury-related death for children in Arizona, especially the one to five year old age group. Every child drowning is preventable – but sometimes, little can be done for a child once he or she has fallen into the water. Prevention is the cure, and awareness is free. DIAM is the largest collaborative water safety effort in the State of Arizona. More than 100,000 purple ribbons were distributed in the DIAM 2009 campaign alone. DIAM proclamations have been signed by Governor Brewer and Mayors across the state of Arizona. Organizations can be listed as “pickup points” for DIAM on Phoenix Children’s Hospital’s website. DIAM events can be listed on the Phoenix Children’s Hospital and Drowning Prevention Coalition of Arizona website. DIAM proclamations will be available for display.